Discussions Magazine Music Blog: BUDDY HOLLY: The closest we may ever get to a box set!? BUDDY HOLLY: The closest we may ever get to a box set!? My love for the music of ELVIS PRESLEY is legendary around these parts. He remains, after all these years, my favorite vocalist of all time. With that being said, it may surprise a few folks when I say that I believe BUDDY HOLLY may have had a bigger impact on my musical tastes than the King did! Some seem to think I named my daughter Holly in honor of the Christmas season.... Let's put it this way: it was a lot better than naming her Buddy! When you look back at the body or work that Rock 'N' Roll icons have left behind, from Little Richard and Jerry Lee Lewis to Elvis and Chuck Berry, you'll find that much of what they recorded were variations on Rhythm & Blues and Hillbilly music (the two main ingredients of the golden era of Rock) but Buddy was different. Yes, he cut his share of R&B and Hillbilly sides, but when you listen to tracks like "Peggy Sue", "That'll Be The Day", "Maybe Baby", "Everyday" and "Words Of Love", you'll hear a melodic element in his music that is haunting, original and, as it turns out, very influential. It's as if he channeled music from a different dimension. 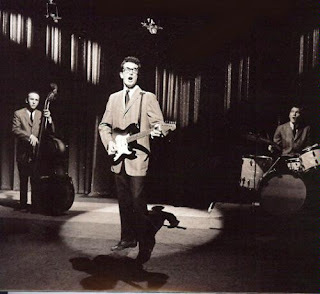 Nobody was like Buddy Holly in the '50s. Even when the Everly Brothers came along, they touched on that melodic element that Buddy perfected, but tossed out the R&B elements, making them unique and mesmerizing, but certainly not as versatile. Buddy's ability to write his own tunes directly inspired The Beatles. You can hear his influence on all their early albums from Please Please Me up through Rubber Soul, whether it's a chord change or John & Paul's harmonies. The fab four even did an excellent cover of "Words Of Love", one of Holly's finest moments. It goes without saying that, without Buddy's influence, The Beatles would have been a very different band. In turn, every band that The Beatles inspired has kept the Buddy Holly influence flowing, from generation to generation. The entire Power Pop movement of the late '70s is heavily indebted to Buddy, as is every form of Power Pop that has cropped up in the three decades since. Over a decade ago, in the pages of POPsided (a fab fanzine), I stated that Buddy Holly was the first real Power Pop artist and I still stand by that statement today! While legal issues have made the box set an impossible task, Decca/Universal have released two excellent collections to coincide with the 50th anniversary of Buddy's death: Memorial Collection (3CDs) and Down The Line: Rarities (2CDs). Although there is some overlap, both are essential purchases for any Buddy fanatic of music fan in general. If you just want the absolute cream of the pop crop, then go for Memorial Collection, which features 60 fantastic tracks beginning with his days as part of the duo Buddy & Bob and ending with undubbed demos he recorded in his apartment in the months prior to his death. Every single track here is worth your while. NOTE FOR COLLECTORS: While his final studio sessions were recorded in stereo, the versions of "True Love Ways", 'Raining In My Heart" and "It Doesn't Matter Anymore" are the mono mixes. Down The Line: Rarities is a double disc collection of rare tracks, alternate versions, out-takes and even more of those final apartment demos. If you've never heard these demos, they are both amazing and haunting. Buddy knew a thing or two about recording and these are just as crystal clear as his studio tracks, but are also warm and atmospheric... and a bit emotional, too. These are demos of songs he was writing at the time, preparing for the next phase of his career, which would sadly never come. Again, an excellent collection should appeal to more than just the true Holly aficionados. And what is truly amazing is that every note contained on these two collections was recorded within a span of five years, from his early recordings with Bob Montgomery, right up until the month before he died. That is roughly the same amount of time that most bands today spend making one album (raise your hand, Billie Joe!). And Buddy did it all by the time he was 23. I don't even think I was out of diapers by then!